A fast-moving wildfire in Southern California has scorched a historic movie site, endangered an iconic bachelor pad and forced numerous celebrities to join the thousands fleeing flames that have claimed homes and prompted the total evacuation of the celebrity enclave Malibu. Lady Gaga, Kim Kardashian West, Orlando Bloom, Jessica Simpson and Guillermo del Toro are among numerous celebrities forced to evacuate their homes, in some cases hurriedly trying to arrange transport for their horses. Some, like del Toro and Caitlyn Jenner, did not know the fate of their homes. But the wind-driven wildfire has destroyed the home of some stars. Gerard Butler shared a photo of his devastated home, where only the beams and a burned-out car remained. The actor thanked firefighters and called it a "heartbreaking time across California." Also destroyed were the home of "Dr. Strange" director Scott Derrickson and the historic Paramount Ranch where shows like HBO's "Westworld" and "Dr. Quinn, Medicine Woman" were filmed. Singer Robin Thicke also posted on Instagram that his Malibu "house is gone." The blaze started Thursday night and continued to grow into Sunday. It pushed toward Malibu and the Pacific Ocean, prompting evacuations in Malibu, Calabasas, Agoura Hills and other nearby areas. A producer for ABC's "The Bachelor" tweeted Friday that the iconic mansion where the franchise has been filmed since 2007 was "in grave danger." The show is currently filming its 23rd season, but the cast is abroad. 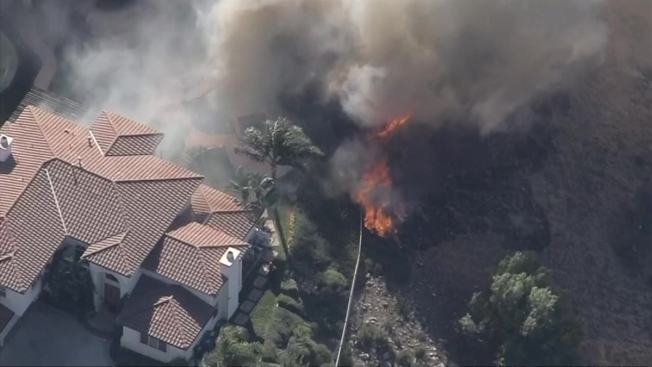 Real Housewives of Beverly Hills star Camille Grammer posted an Instagram photo of her home aflame, writing, "Sadly my house couldn’t be saved." Rainn Wilson shared on social media that the flames missed his home "by a dozen yards!" He said his animals were saved and that his family was overseas at the time. Caitlyn Jenner, whose hilltop home appeared intact when it was shot by a photographer for The Associated Press on Saturday morning. Jenner's representative noted that the Olympic gold medalist wouldn't know the extent of any damage to the home until she was allowed to return to it. Kardashian West posted video on Instagram of an area on fire with a message "Pray for Calabasas." She said she landed back home, spent one hour packing and evacuated shortly afterward. Her fellow Kardashians and Jenner's also posted to social media that they were waiting for word of the fate of their homes. Gaga also took to social media letting her followers know she evacuated Friday morning as she shared a few videos focused on the smoke-filled skies. The singer said she is "sending my prayers" to everyone impacted by the fire. "I'm worried about my house, but there is nothing I can do," she tweeted. "Friends houses have burned. I can't bear the thought of there being no Malibu I've had a house in Malibu since 1972." Bloom and Simpson wrote on social media that the fires were growing close to their houses and streets. In addition to dozens of homes destroyed, Paramount Ranch's "Western Town," a landmark film location that included a jail, hotel and saloon, had burned to the ground. Filming continued for decades even as the ranch changed hands. It was acquired by the National Park Service in 1980 but has continued to function as a filming location, serving as a location for the first two seasons of the sci-fi series "Westworld." HBO said it did not know the extent of the damage and expressed concern for "all those affected by these horrible fires." He also tweeted resources for horse owners to have their animals evacuated from the Southern California blaze, and called Milano's report that her family and horses had been evacuated "good news." Associated Press Writer John Antczak contributed to the report.